Then the squirrels began to invade the backyard. Our neighborhood doesn’t have very many squirrels (yet). It’s an old orange grove with 10-ish year old houses. The tiny oak trees that the builder planted have finally started to be big enough to start attracting some more interesting birds and their four-legged friends. So in the past six months or so I’ve started putting out baffles and reworking my feeder setups in order to maximize the seed that makes it into the birds’ beaks! The sunflower seeds that fell around my feeders this winter sprouted, and pretty soon I had beautiful tall stalks of sunflowers. 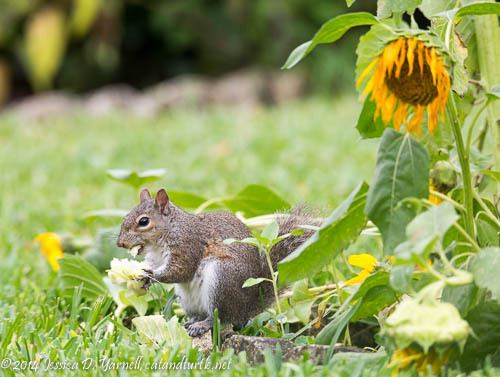 I had dreams of photographing my bright yellow American Goldfinches on the sunflowers, until Mr. Squirrel decided that those seeds were for him. Just as soon as the flowers started to seed, the silly squirrels would knock them down and devour them. You know how you nibble a piece of corn on the cob? Well, that’s how efficiently this squirrel devoured my pretty flowers.